One of the best tools to use when you want to find boost and EVAP leaks is with an EVAP smoke machine. I work as a diagnostic technician and one of my most frequently used machines/tools is the EVAP smoke machine. Whenever I get a trouble code of a lean mixture or a low boost pressure, I start to check the intake for any leaks with a smoke machine. This blog post is a list of the best smoke machines on Amazon for both home usage and professional usage. You will find the best EVAP smoke machines at different price ranges here, depending on if you are going to use it for professional use or you want a cheaper one at your garage at home. The price range of these machines is 150-1600$. For the correct price information, go to the “Check Price” button to see the correct price. That’s because the price can change fast. Check our FAQ section about EVAP smoke machines further down in the article or click here. The OTC 6522 is our top pick of this review. This is because it’s a high-performance machine sold for a decent price. The kit includes a lot of required tools to make a good diagnostic of your vehicle. This is an updated version with half the size and twice the power of the recent model of this smoke machine. 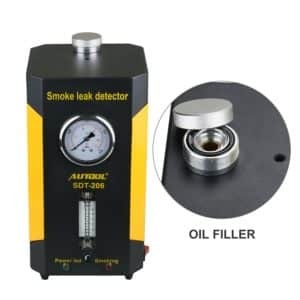 This smoke machine can detect leaks below 0.010 inch and got a high-performance flow control adjustment for the amount of smoke you want to inject. It uses UV fluid to detect even the smallest leaks which could not be found with only the smoke. The kit does include the UV light and the UV glasses that are required to see the UV fluid. It does also come with the necessary adapter you need to connect to your intake pipe. It does also come with an adapter to connect to your exhaust pipe to find any exhaust leaks. A high-performance smoke machine perfect for any car repair workshop which I could recommend to get. The price is maybe a bit high for usage for home, but if you can afford it, you will not get disappointed. Check the current price on Amazon on the button below. 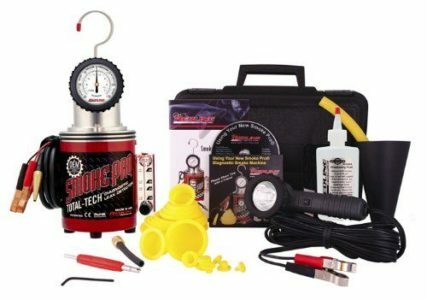 The Redline Smoke Pro is the smoke machine that I’m using myself at my workshop. It has worked flawlessly through hundreds of leak test, and it’s worth the price. Simple to use and the only thing you require is compressed air, car battery and the recommended oil for the tool (Baby oil works fine also). It has a valve control to control the amount of smoke you want and a gauge for the pressure. It comes with the required adapters and tools to start to use it instantly after delivery. A simple and high performing smoke tested for any use at workshops or home. Just connect compressed air and 12-volt power, and you are ready to go within seconds. Perfect to find tiny leaks both in EVAP, intake and Exhaust systems. Very simple to use. One start button and you are ready to go. The EVAPro smoke machine from Vacutec is our highest performing smoke machine in this review. The price is higher than the other smoke machines in this review, and so it the performance. This machine may be a bit too expensive for the most home users and will probably fit better in car repair workshops. It uses a patented UV solution to deposit the fluid at the required locations. It uses high technology 2 minutes test to get a passed or failed result which verifies leaks down to 0.020″. This is a real high-end machine which comes with all the functions you need and a two years warranty. This smoke machine can find all kind of EVAP codes fast and comes with all the required adaptors for these tasks. Test the whole intake system or just the small EVAP hoses. Here is the smoke machine for those who should not use the smoke machines a lot and will do it for home usage. This is our budget smoke machine which has a lot lower price than the other devices mentioned in this review. But, You will get a lot for the money, and this machine is perfect for the price. Price-Worth if you should use it for home. The Smoke-Tek uses mineral oil to perform (You can also use baby oil if you want). 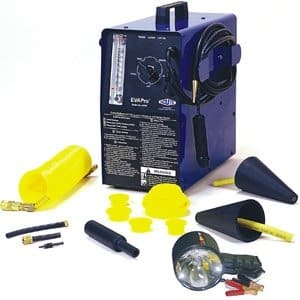 Just connect your air compressor and connect the 12-volt power to your vehicles battery and this smoke tester will perform. It gives a slightly lower amount of smoke than the other machines mentioned, but the price is a lot lower, and it will produce the required amount of smoke for most of us. This is the smoke machine which I would get if I were getting a smoke machine to use at home a couple of times to get rid of my trouble codes! Video test of the amount of smoke it produces! Then we have come to the last review of EVAP smoke machines in this article. 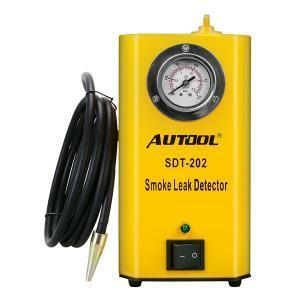 It’s the Autool SFT-206. This is also one of our mid-budget alternatives. It’s double the price of the Smoke-Tek machine but half the price of the RedLine smoke machine. This is the machine for the garage or a small workshop owner that does not want to spend too much money on a smoke machine but still want a very reliable one. 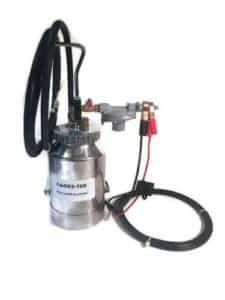 This machine has an inbuilt air compressor which gives instant smoke generation. It has an adjustable flowmeter with a pressure gauge which you can get the right amount of smoke which you require for the task. It comes with the required adapters for an intake leak test and EVAP leak tests. With this machine, you do only have to fill oil and connect the 12-volt power to your car battery to make it work. I have a car repair workshop, which smokes machine should I choose? If you want a good smoke machine for a reasonable price, you should choose the OTC 6522 LeakTamer. 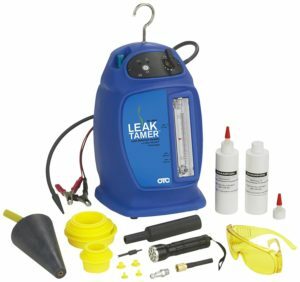 It’s a kit of the most required tools for any intake leak troubleshooting. The price is in the mid-range of smoke machines. If you do want an even better smoke machine and a bit more money to spend, you should choose the EWApro 2000E in my opinion. The price is double of the OTC smoke machine, but you will get much better performance. I do want an EVAP smoke machine for home usage, which one should I choose? It depends on how much money you want to spend for your home usage. The cheapest in our list is the Smoke-Tek machine if you want more performance you to choose the Autek SDT-206 machine instead. You have to spend a bit more on this machine, but in my opinion, it is worth it if you check what you get for the money. The Autek machine will give you everything you need for troubleshooting for home usage. How often do I have to refill the EVAP smoke machines? It depends on what machine you choose and what type of oil it uses. It will take a lot of troubleshooting before you have to replace the oil, depending on the length of the smoke test. In my machine at my work, it takes around 10-15 smoke test before I have to refill it. In most of these smoke machines, you can also use natural baby oil, which is not so expensive. You should always double check with the manufacturer of the machine to find out if you can use baby oil in the machine. With what should I fill my smoke machine? Normally the smoke machines use a special oil in their machines. In many cases, you can fill the machine with baby oil instead. Double check with the manufacturer of the EVAP smoke machine to make sure it’s compatible with baby oil. If you can fill baby oil in it, the price for oil fill will get a lot lower. How long time will it take to fill the intake with smoke? It depends on the smoke machine and what volume setting you are using on your machine. To fill an intake and boost pipes, usually does take a couple of seconds. If you are using it to find leaks on smaller hoses like EVAP hoses, it will just take a second to fill it with smoke. The most of these machines are pretty fast to fill it with smoke. Is a smoke machine an excellent way to find EVAP and intake leaks? It’s one of the best ways to fix EVAP and intake leaks in my opinion. I work as a diagnostic technician, and I’m using these smoke machines for daily use to troubleshoot my customer’s cars. Whenever I got a lean mixture, misfire, boost control trouble code, I start to check the intake with a smoke machine. If you have a workshop and are not using a smoke machine, I can recommend you to get one, and it solves a lot of problems which could be hard to find if you don’t have one. Is it enough with 12v power to them? Some machines use only 12v power, and some use 110/230volt wall electrics, depending on the machine. Some of the machines use both 12 volts and 110/230 volt connector. You can take the 12-volt power from your car battery. Check the machine before you are buying it to make sure you get the right connectors and get information on how to wire it correctly. Some does also require compressed air to work. How to use an EVAP Smoke machine? To use a smoke machine is very simple in most cases and with the most machines. This is a general list of how to do it, and you should always follow the instructions from the manufacturer when you are installing and using your smoke machine. Connect an adapter that will fit into the part you want to smoke test and make sure it fits tightly. Connect your power resource, either on your car battery 12-volt power or 110/220volt supply. Some smoke machines have both of the authorities. Some will also require compressed air. Check for any signs of leaks around all essential parts. Some smoke machines have UV in the smoke, so you can use a UV light to check for any leaks. What kind of trouble codes can you diagnose with a smoke machine? You can diagnose the most kind of trouble codes with a smoke machine. You usually use it to detect EVAP leaks and turbo boost pipes leaks. It’s also perfect to find any leaks around the intake or the exhaust pipe. If you have any lean or rich mixture trouble codes, you should always use an EVAP smoke machine to find any leaks fast. Misfire codes are usually caused by intake or boost leaks and should be diagnosed with a smoke machine. Worn out turbo boost pipes often cause turbo boost control problems, and a smoke machine will help you to find the problem fast. So, intake and EVAP leaks can cause a lot of different trouble codes, and it’s a perfect starting point to start checking with a smoke machine the first thing you do. Air leaks can be hard to identify and can cause severe problems and a lot of trouble codes. I use an EVAP smoke machine on almost every trouble system I get when I’m finding problems on vehicles. How does an EVAP smoke machine work? A smoke machine uses a heater inbuilt and evaporates the special oil or the baby oil to smoke. It does then push it into the area which you want to leak test. Smoke machines can detect micro leaks below 0.010″ inch, and some of them does also have the ability to inject UV additives to the smoke, to check small leakages with a UV light. The heater inside the EVAP smoke machine is either ran by 12-volt power or 110/220 volt power. Some smoke machines do also use compressed air to push it into the test area. Some have an air compressor inbuilt for this task. It is significant price differences in smoke machines, but as with a lot of items, you will often get what you pay for. It’s the same case with EVAP smoke machines. You can often fill Baby oil in these machines to create smoke. Check with the manufacturer of the machine before filling it with baby oil. Filling your machine with baby oil can damage the machine if it’s not compatible with it. Better safe than sorry. An EVAP smoke machine is one of the best ways to find a mixture, EVAP and boost related trouble codes, and I use one myself for a daily basis. You can solve a lot of different trouble codes with a smoke machine, and it will save you a lot of time on troubleshooting if you don’t have one already. Double check to make sure you get the right connectors for your country for the machine before buying it. Check if you get any oil required for the machine within the purchase. If you have used any of these smoke machines and wanted to write your review about them, comment down below. If you have any other car questions, you are welcome to ask them at our homepage.